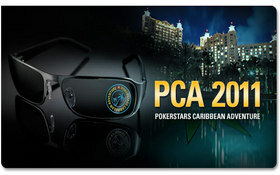 After throwing down a massive $100,000 each, the final table of the PCA Super-High-Roller tournament is set, but the seven remaining players are still two spots away from the money, as the 5th place finisher will walk away with the highest min-cash in the history of poker, a $200,000 score! The final table was supposed to be an 8-handed affair, but a player from each of the remaining two tables was eliminated on the same hand, as both Daniel Cates and James Obst were eliminated at the same time. Since there was no money bubble the tournament was not being played hand-for-hand and neither player knew what was taking place at the other table. The chips-stacks heading into the final table are quite uneven, as Nick Schulman’s nearly 3 million chip-stack and Daniel Negreanu’s 2.1 million chips constitute well over 50% of the chips in play; with Andrew “luckychewy” Lichtenberger and Sandor Demjan both nursing extremely short-stacks. The final table for the tournament will get underway at 1PM tomorrow, and don’t forget about that Isildur1 press conference scheduled for 7PM! This entry was posted on Saturday, January 8th, 2011 at 5:02 pm and is filed under Poker News. You can follow any responses to this entry through the RSS 2.0 feed. You can leave a response, or trackback from your own site.